I had to share this little gem of a find. Hubby showed it to me the other day and instantly I thought of my two boys. Not because Baxter is blind, but because these two pups look so much like my Baxter and Chase and I know my Chase would do anything for his big brother… You know how some people say we all have a twin in the world that looks like us… It is kind of cool as it seems Baxter and Chase have twins in the world too. Good story to start the weekend. Thank you for sharing. It’s a glorious story! Thanks for sharing. oh! so beautiful, I will go and read the story right now! 🙂 (they do look like Baxter and Chase) wow! Matt and I have now had 2 blind dogs in our 20 years together (both Labradors with retinol atrophy), and we have seen this happen at our house as well. 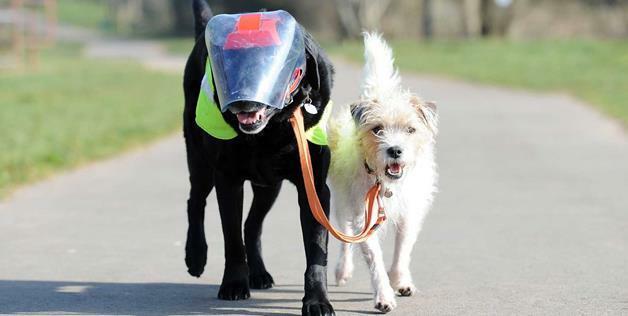 The “other dog” helps to guide and lead the blind dog. It is truly a beautiful thing to watch. We lost our first blind dog to old age (she lived to be 13) about 7 years ago, and our second one is still begging for belly rubs next to my chair as I type this. Dogs are truly a blessing–they show us loyalty, love and pure joy. Thanks for sharing.